The development of a new Belfast Interface Project strategic plan was an interactive process, involving the Board and Staff Team. This entailed a review of the policy context and the implications for BIP, a review of current/last plan highlighting areas of success and challenges, a series of individual interviews with Board and Staff members and two discussion workshops with the Board and staff. The intention and approach throughout was to ensure that BIP is working to an agreed course of action which will provide the direction of travel for the organisation in the future but is flexible enough to allow BIP to respond to changing needs and circumstances within communities and to opportunitites and challenges which will arise. 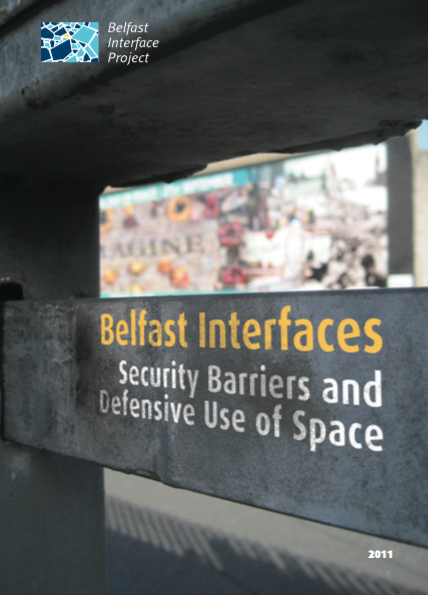 In Spring of 2011 Belfast Interface Project (BIP) commissioned a piece of research carried out by the Institute for Conflict Research (ICR) to identify and classify the known security barriers and associated forms of defensive architecture in residential areas of Belfast. This document draws heavily upon the final research report produced by ICR and brings together photos and information from past BIP research projects including those undertaken by Frankie Quinn in 2005 and ICR in 2008. The document is organised into two sections: Section 1 provides an overview of defensive architecture and associated blighted space in Belfast, and Section 2 provides a comprehensive listing with photographs and descriptions of security barriers and defensive use of space throughout the city, organised geographically by cluster. The main aim of this research was to look at the situation of minority Polish community in Belfast, in order to examine the main issues emerging in the process of integration of a relatively new community into local society in Belfast. The survey was conducted in Polish mainly online, and survey questionnaires were made available through various media outlets such as the Polish Association website, newsletter of numerous NGOs, mighrant portals and the Community Relations Council website. BIP commissioned Copius Consulting to undertake a survey of its members, board and staff in August 2015 focusing on interface issues and member's needs. This survey would assist BIP to inform and shape its future organisational direction and membership provision. In addition to conducting this survey the assignment brief included carrying out a comparative analysis of findings from this survey in relation to previous surveys conducted in 2004 and 2008. This report outlines the findings of this assignment. within the larger Inner East Outer West project. October 14th to 24th 2013.
narrative, including a number of interviews with workshop participants. the 'Inner East Outer West' publication, outlined below. PEACE lll initiative over the period July 2012 to December 2013.
and voluntary groups across each interface and between areas. • Increase levels of mobility amongst project participants. This publication outlines the broader 'Inner East Outer West' project and contains photos of participants across the range of project activities with their thoughts regarding the project. This publication was produced in hard copy as a back-to-back book with the 'Exchanging Perceptions' publication, outlined above. 'Polish residents in Belfast: Issues of discrimination, safety and integration' outlines the findings of a piece of research carried out on behalf of BIP by Iwona Wardach through the support of the European Grundtvig programme, and recently uploaded to our website. The main aim of this research was to look at the situation of the minority Polish community in Belfast, in order to examine the main issues emerging in the process of integration of a relatively new community into local society in Belfast. 1. Community safety and issues of discrimination on the basis of ethnicity. 2. Levels of integration, as well as knowledge about Belfast and its history. 3. Freedom of expressing religious and cultural identity. This new research commissioned by Belfast Interface Project identifies and classifies the known security barriers and associated forms of defensive architecture in residential areas of Belfast. This report is part of the Belfast Interface Project (BIP) ‘Supporting Sharing’ project 2010. The report considers ‘effective practice in promoting shared space at or near an interface’ by using information from desk research and interviews conducted with key stakeholders / practitioners. It describes the dynamics and the positive and negative lessons that practitioners and key stakeholders working at or near interfaces have reported. This report analyses how the tensions over parades are being dealt with in towns and villages across Northern Ireland and the extent to which local attempts to reach accommodation have been successful in reducing tensions and move towards resolving the dispute. The research focuses primarily on disputes in smaller towns and rural areas and through highlighting areas where progress has been made the report aims to identify lessons that are applicable in trying to deal with disputes in other locations. The Whitewell Youth Mediation Project is an initiative to address youth-led interface violence, mobility restrictions and contemporary urban youth issues at a local level. This report is a case study of this ongoing project, documented through interviews and focus group discussions with project partners and participants. Given that parades and parade-related protests and disputes have generated division in recent years and that this division has translated into conflict in a number of interface areas, it seemed appropriate to commission the Institute for Conflict Research to bring together within one document a collection of abstracts of existing literature on this subject. This annotated bibliography aims to provide a resource to people wishing to trace and understand the dynamics of current parades-related disputes and the various initiatives that have been taken in relation to these. The bibliography summarises all of the main writings on the current cycle of parades and protests. These include academic studies and documents written by advocates of parading and by their opponents, and also a large number of policy documents that have been generated by the disputes over the past decade. The document includes a number of studies that provide a historical background to parading in Northern Ireland, and also works that focus more on the loyal orders that are responsible for organising the parades. As with our earlier ‘Interface Issues’ bibliography, BIP has brought together a library of hard copies of the source materials summarised within it. This library is housed in our offices and is available to BIP members and key stakeholders. We aim, over future years, to continue to regularly update both this bibliography and the library of source materials as new literature is added. We hope you will find this resource relevant and useful. We produced in 2005 a collection of abstracts booklet called ‘Interface Issues: an annotated bibliography’, which contained summaries of 82 different pieces of literature that had been written about interface areas and issues over the period 1976-2004. We commissioned the Institute for Conflict Research (ICR) to prepare this for us. This document represents the 2007 update to that booklet, prepared for us by ICR and containing summaries of approx 20 newer pieces of work, inc some that we missed last time. Again, BIP has brought together a library of hard copies of the source materials summarised within it. This library is housed in our offices and is available to BIP members and key stakeholders. We aim, over future years, to continue to regularly update both the collection of abstracts document and the library of source materials as new literature is added. Much has been written about interface areas and issues by researchers, academics, community and statutory agencies and others. This body of work represents a considerable store of knowledge and experience, insight, theory and opinion in this areas, gathered over many years. One of the aims of BIP is to enhance and develop the knowledge base regarding Belfast’s interface areas. In order to facilitate this process of knowledge development, it seemed appropriate to commission the Institute for Conflict Research to bring together within one document a collection of abstracts of existing literature. Accompanying this document, BIP has brought together a library of hard copies of the source materials summarised within it. This library is housed in our offices and is available to BIP members and key stakeholders. We aim, over future years, to regularly update both the collection of abstracts document and the library of source materials as new literature is added. The survey was structured in two sections. The first, An Audit of Interface Issues, examines perceptions of conditions and perceptions of change over the last ten years in interface communities across Belfast. Section Two, Members' Needs, contains further qualitative information regarding the support needs reported by BIP members. Full PMG report commissioned by Belfast Interface Project. This document was prepared by Belfast Interface Project in 1998 and was based on the work of this project in identifying key issues of concern to interface communities within Belfast.